KUCHING: Kenyalang Badminton Club (KBK) will organise a basic coaching clinic to promote the interest of Dayak parents and children in badminton. It will be held at BDC Stampark hall here on Dec 1 and 2 from 8.30am to 5pm daily. 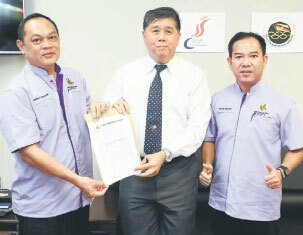 Sarawak Sports Corporation (SSC) and Sarawak State Sports Council (MSNS) will provide the trainers for the clinic which is expected to draw around 40 participants. According to KBK secretary Anthony Ugor Nili, the clinic came about as not many parents encourage their children to develop the skills or join bigger tournaments due to the lack of training centres. “I think badminton development programmes have to be done in a more integrated and holistic manner so that we can unearth talents from the youth,” he added. Last Tuesday, Anthony accompanied KBK advisor Churchill Edward to pay a courtesy call on SSC CEO Dr Ong Kong Swee at his Stadium Sarawak office in Petra Jaya here. Churchill was representing KBK patron Dato Sri Dr Stephen Rundi Utom. KBK is having an active year in 2017. It organised an age-group tournament closed to members of the Dayak community and provided technical services in the Sarawak Dayak National Union (SDNU) President Cup. The club will also be providing technical services for the upcoming Parti Rakyat Sarawak (PRS) tournament, apart from holding a blood donation campaign. KBK will host its age-group tournament in Bintulu next year due to popular demand from the northern regions.